Manufactured in Japon from 1999 until 2002. 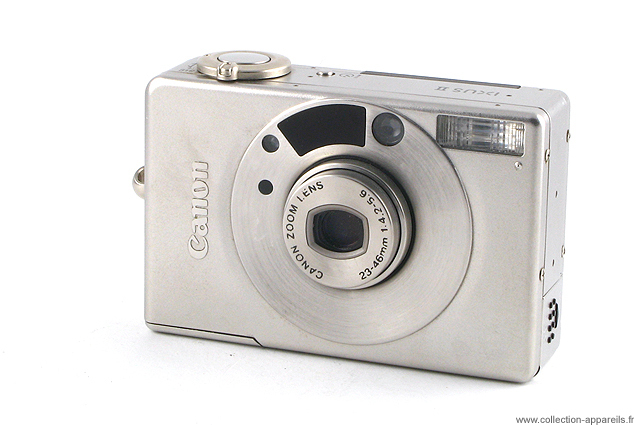 This IXUS II is a superb jewel camera for films APS IX240. Its completion “steel” is more beautiful effect. Its sizes are 87 X 57 X 24.5 mm. It weighs only 170 grams. This autofocus system is with programmed automatism. Thelens is a zoom Canon F 4.2-5.6/24-46 mm (equivalent of 29/87 format 135). The minimal distance from map is of 0.45 M.
The image obtained makes 16.7x30.2mm. Three formats of final impression to the choice are available: normal - 16/9 - panoramic. The viewfinder is with real image with AF frame and “close-up” frame. There is two luminous indicators > green and orange. The advance and the rewinding of film are automatic. Rewinding during film is possible. There is a self-timer at 10 seconds, a voluntary correction of exposure. The films from 25 to 10,000 ISO are accepted. It has an integrated flash there. With the back, a LCD display control screen is. Many “functions” (dates, mode of flash, rewinding, multilingual titration of the photo etc.) can be used while pressing on tiny buttons, thanks to the small point associated with the wrist-strap. I never tested this camera, but I always heard good about it. A great future “collector”?